U.S. equities may be off to a strong start in 2019, but growth forecasts are adding to investors’ wall of worry as a Wall Street Journal survey revealed that economists are projecting lower growth and employment for the first quarter. The lower forecast comes as the latest round of economic data is weighing on the minds of economists. Last week, the Labor Department said that 20,000 jobs were added in February, falling well below a Dow Jones poll of economists who were expecting 180,000. It marked the weakest month of job creation since September 2017, stoking more fears of a global economic slowdown. The survey, which includes private-sector economic forecasters, are expecting U.S. economic output to grow at an average pace of a 1.3 percent in the first quarter. In early February, forecasters were predicting a 2 percent growth rate from January to March. If, in fact, GDP were to expand at a 1.3 percent annual rate as suggested by the first quarter projections, it would mark the weakest pace of growth since 2015 when the fourth quarter saw a growth rate of 0.4 percent. 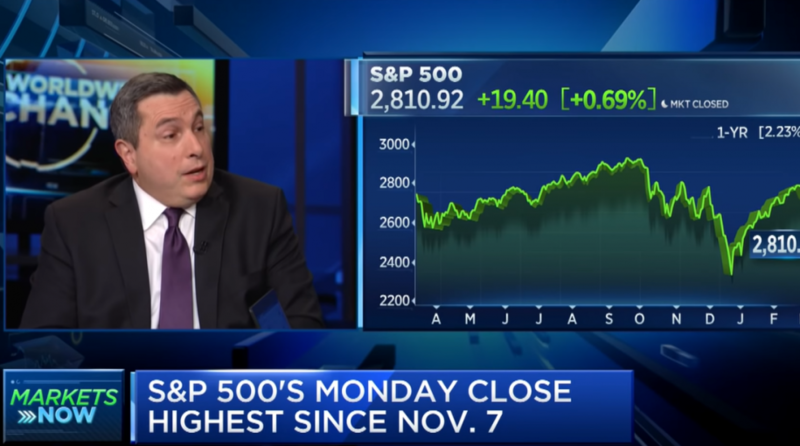 In the video below, Julian Emanuel of BTIG discusses the U.S. market’s move higher, and how part of that can be attributed to resolving some of the “known unknowns,” such as whether Brexit will happen.